Award Winning Nutrients developed by Green House Seed Co to target specific types of plants. Easy to use, cost effective, Keeping it Simple! 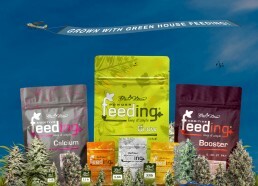 Green House Feeding is a award winning nutrients brand by Green House Seed Co. The fertiliser range is specifically developed to target different types of plants. It’s easy to use & cost effective, for both professional & amateur gardeners who like Keeping it Simple! Award Winning Nutrients by Green House Seed Co. Ever since we started growing and breeding plants we have been looking for the perfect plant feeding. Simplicity is our secret for success. Most fertilizer brands on the market require customers to buy a line of products, making things expensive and complicated. We aimed in the opposite direction, creating a powder product that delivers unprecedented results with minimum cost and a user-friendly approach. Easier to transport, easier to store, easier to use, and with a longer shelf life than liquid fertilisers. Organic and mineral fertilizers have been used in agriculture for thousands of years, however, the agricultural techniques and resources didn’t change much. The modern technologies and knowledge we have today, allows us to create a Bio Feeding Line that delivers unprecedented results in the most easy way. Simplicity is our secret for success. 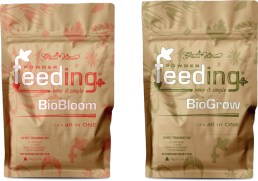 Green House Bio Feeding “ALL – IN – ONE” fertilizer contains a combination of natural-minerals and organic nutrients which provide all essential macro- and micronutrients to the plants with just one application. Green House Bio Feeding also contains beneficial fungus and bacteria which promotes microbial life in the soil and faster decomposition of organic matter. Our Green House Additive Feeding CALCIUM is very soluble, easy to use and quickly assimilated. Calcium is essential for growing a healthy crop. It prevents and corrects deficiencies which are caused due to a lack of/or imbalance in the assimilation of Calcium. After creating Green House Bio Feeding we decided to develop a very specific product that would allow growers to maintain healthy and strong plants. A healthy root system free from pathogens and diseases is the key to growing strong plants and achieving high yields. Our Additive Enhancer meets all these requirements and is very soluble, easy to use and acts quickly.